What is a Va Form 21 0781? A VA Form 21-0781 is used by the United States Department of Veterans Affairs. A VA Form 21-0781 is used by the United States Department of Veterans Affairs. This form is known as a Statement in Support of Claim for Service Connection for Post-Traumatic Stress Disorder (PTSD). This form will be completed by a veteran who has been diagnosed with Post-Traumatic Stress Disorder. They will need to document the stressful events that contributed to the disorder during their military service. This form has room for two stressful incidents, although more can be included if necessary. 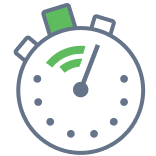 For each event, the filer will need to include the date it occurred, where it occurred, what unit the soldier was assigned to, and a detailed description of the event. If a serviceperson was killed or injured during the stressful incident, this information should be included as well. This allows the Department of Veterans Affairs to assess the situation and understand what happened. Both VA Form 21-0781 and VA Form 21-0781a are used by the VA to gather information about in-service stressors that could have contributed to a veteran’s PTSD. While these two forms collect similar types of information, they are meant for different types of trauma. VA 21-0781 is used for general post-traumatic stress disorder and VA 21-0781a is meant to be used for cases that involve personal assault, military sexual trauma, and physical attacks. Create a free Va Form 21 0781 in minutes with our professional document builder. 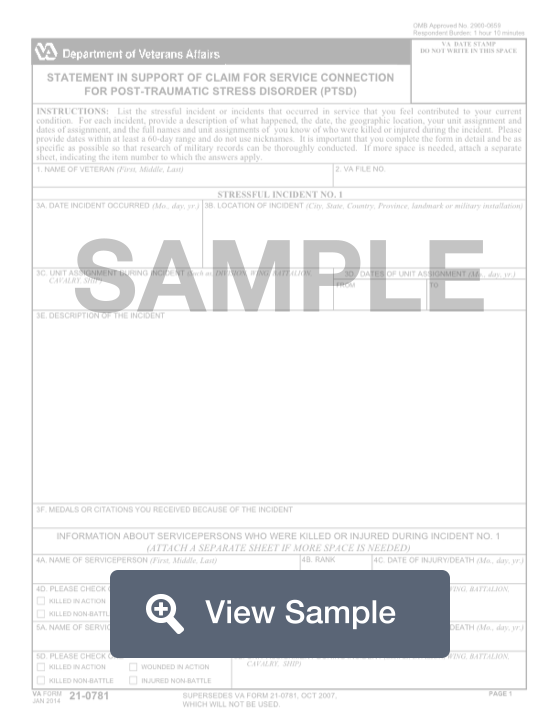 This form is commonly used by veterans to describe a stressful incident or incidents that occurred in service that the veteran feels contributed to his or her current post-traumatic stress disorder (PTSD). The VA will not disclose information collected on this form to any source other than what has been authorized under the Privacy Act of 1974 or Title 38, Code of Federal Regulations 1.576 for routine uses (example: civil or criminal law enforcement, congressional communications, epidemiological or research studies, the collection of money owed to the United States, litigation in which the United States is a party or has an interest, the administration of VA programs and delivery of VA benefits, verification of identity and status, and personnel administration) as identified in the VA system of records, 58VA21/22/28, Compensation, Pension, Education and Vocational Rehabilitation and Employment Records - VA, published in the Federal Register. Your obligation to respond is voluntary. However, the requested information is necessary to obtain supporting evidence of stressful incidents in service. If the information is not furnished completely or accurately, VA will not be able to thoroughly research your military records for supporting evidence. The responses you submit are considered confidential (38 U.S.C. 5701).